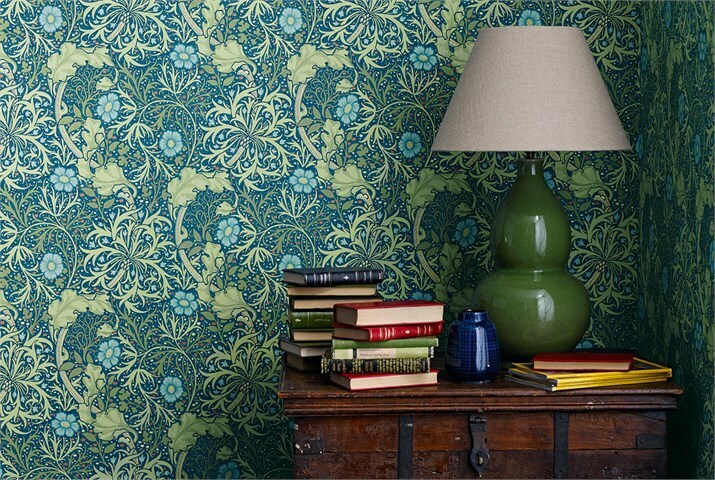 Inspired by documents spanning the decades from the 1870s to the eve of the First World War, the Archive III Wallpapers demonstrate the breadth of patterns in the Morris & Co. archive created by Morris and John Henry Dearle, and less well known designers. Kathleen Kersey’s ‘Arbutus’, and Kate Faulkner’s ‘Bramble’ represent some of the contributions made to ‘The Firm’ by the women artists and designers Morris employed. The popular ‘Mary Isobel’ embroidery design has been transferred to wallpaper, as has Morris’ impressive ‘Honeysuckle & Tulip’, whilst new ‘Rosehip’ is inspired by his designs for tile decoration. Alison Gee’s ‘The Brook’, created after Dearle’s tapestry of the same name, continues the hugely successful theme of large-scale, scenic designs inspired by early Morris & Co. wall-hangings. The Studio have developed Morris’ pared-back, monochromatic patterns such as ‘Bachelor’s Button’, beautifully and expertly re-coloured into seven timeless colourways. Complemented by the Archive III Prints and Woodland Embroideries, the nine designs in Archive III Wallpapers are available in classic, warm colour palettes and new, cool grey tones for the traditional and more contemporary interior.